My kids have inherited my tendency to obsess over things. 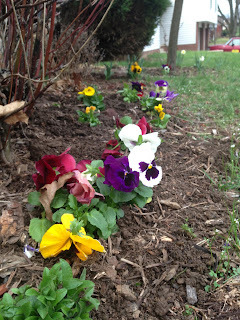 Right now, my five year old is obsessing over pansies. A few weeks ago, his kindergarten class started coloring spring scenes. He was so interested in the idea of spring he started drawing his own scenes of budding trees, eggs in nests, frolicking animals and flowers in bloom. But since he's only five, his desired results exceeded his artistic capability. And when he messed up his dandelion, he wept and wanted to blacken it out. I whipped out my smartphone and showed him a photo of a pansy, yellow with a pulsing purple center - and he was entranced. From then on, he declared pansies, or "face flowers" his favorite. And he was an expert at drawing them. Because I acknowledge the power of an obsession, I purchased gardening gloves and three flats of face flowers. We worked together so pleasantly one afternoon and put every little plant in the ground. He kept saying, "Welcome to Pansy World!" with no irony at all. The variety of colors enchanted him. He talked about saving the earth and delighted in each worm sighting, thanking the spineless little guys for keeping his garden soil healthy. Gardening is a great hobby, but I always wonder if the things they love as children gives me insight into who they will be as adults. Earlier in the same day I had introduced the idea that he could be a comedian when he grew up. "You stand at a microphone in front of a crowd and tell jokes and funny stories, and when people think you're funny they laugh and clap for you," I said. For a moment he forgot about the flowers that were waiting outside. I could see the wheels turning in his head after that discussion. So while we were gardening, I mentioned that landscape design was also a job he could do as a grown-up. "Actually Mom, this is a job I am doing right now," he explained. He is so patient with me.